Visit the birthplace of yoga. Take your yoga off the mat. Join Wilmington Yoga as we travel to Kerala, India for an annual yoga + service retreat. We’ll take a backwater tour, explore the jungle + city-life, + most importantly, visit the Homes of Hope Orphanage to see the girls we support throughout the year through the Kunga Fund. GROW THE SPIRIT AND THE SOUL. Opening ceremonial group dinner of traditional Southern Indian Kerala cuisine, curries and coconut, pappadams and masala! Adjunct Faculty Noelle Whittington, ERYT500 leads 200 and 300 hour Kunga Yoga Lifestyle Teacher Trainings. Noelle is also a Professional Level Kunga Yoga Leader, completing a 350 hour advanced apprenticeship certification with Kristin Cooper-Gulak; and is currently pursuing her 1000hour Kunga Yoga certification. 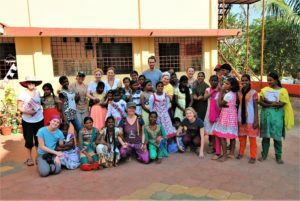 She is deeply committed to the Kunga Yoga mission of service, spending much of her time in India and in the U.S. working with and for the girls of the Homes of Hope Orphanages in Kerala, India. Noelle has been teaching since 2006, beginning her yoga studies at the Nosara Institute in Costa Rica, and studying Thai Yoga Massage in Chiang Mai, Thailand, completing advanced-level certifications in the Lek Chaiya tradition. She is a certified Pilates Mat and Pilates Reformer teacher, completing over 250 hours in advanced anatomy and pilates technique training and is also a certified 5Elements Flow Yoga Teacher Trainer and certified Kunga Vinyasa Trainer. Her additional certifications include Interdisciplinary Yoga, Fluid Power Yoga, and Thai Yoga Therapy. Noelle’s primary teachers include Ashley Ludman, Kristin Cooper-Gulak, and Larry Hobbs. She has also completed trainings with Hilary Garivaltis in Ayurveda, Marlysa Sullivan in Anatomy of Yoga and Therapeutic Yoga, David Emerson in Yoga for Trauma and PTSD, and Pre and Post Natal Yoga with Heather Till. Noelle has assisted Anusara-based Seaside Yoga Teacher Trainings and Transformation Retreats with Ashley Ludman and has led retreats to Ambergris Caye, Belize, with Elizabeth Cramond RYT. Due to her dynamic classes and community following, Noelle has been chosen as an ambassador of both Manduka and Lululemon. Yoga, music, dance, service work, and travel are her passions, and she enjoys incorporating these experiences into her teachings to create a safe, fun, and effective experience appropriate for all ages and levels. Noelle enjoys empowering the student to connect with their inner teacher. Adjunct Faculty Trey Barefoot, ERYT200 is drawn to yoga for it’s fascinating ability to empower the student. He began his path toward healing in a high school gym class and then continued practicing at Seaside Yoga and Wilmington Yoga Center for a few years. After graduating from Seaside Yoga’s teacher training in 2009, he completed a second teacher training at the Costa Rica Yoga Spa in Nosara the following year. Since then, he has taught public classes and led retreats in Australia, Hawaii, Mexico, Costa Rica, and Wilmington. He loves teaching at beach resorts and for the past two years he has taught Stand-up Paddleboard Yoga on the magical haven of Block Island, Rhode Island. All Kunga Journeys retreats and trainings are dedicated to educating the public about approaching yoga as a path of service. Our projects involve fundraising for Class-5 non-profits, which serve children, animals and the environment. Kunga Journeys programs provide hands on opportunities to volunteer with underserved communities. Some highlights of our service work since 2006 have included placing over 150 yoga teacher-trainees in underserved communities in the U.S, coordinating group volunteering with orphans from Rwanda, Jamaica, India & Thailand, and raising over $50,000 in funds and schooling for various local and international charities. In the event of cancellation, the following policies apply:· 60 days or more prior to the retreat: Your payment will be refunded, less a $250 administration fee.· 59 – 46 days prior to the retreat: Payments are not refundable, but are transferable (less $250 administration fee) to a studio account credit.· 45 days or less: Payments are not refundable or transferable, as your payment has already been processed. The above policies apply regardless of the reason for cancellation (such sickness, death in family or emergency, etc). Unfortunately, group contracts and packages have been pre-arranged and pre-paid with hosts at the time of registration and we do not have control of refunds or credit beyond the above exceptions. Retreat does not include food costs for “free night” dinners, or extra travel costs associated with other tourist attractions. All activities, yoga, and volunteering are optional. Some participants and significant others choose to rest, go sight – seeing, etc, and nothing is mandatory on our retreats. Disclaimer: We reserve the right to cancel retreat should we have less than minimum of 10 participants registered. Registrants will be notified by Nov 25th in the rare case that trip is cancelled. Please contact retreat coordinator with questions.